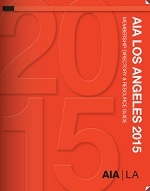 Your digital edition of AIA Los Angeles - 2015 Membership Directory & Resource Guide is available now. Clicking on the Table of Contents will deliver you directly to that page of your issue. Thank you for reading! Thank you to our advertisers. Their support helps make this publication possible. Members who renewed or joined by the due date of April 1, 2015 are listed in the 2015 Directory. Members who joined or renewed after that date will be listed in the 2016 Directory if they are active and in good standing on April 1, 2016.